Who wants to play guess that doggie? The people who guess the correct answer will receive some special blog bling from me. So, which doggie is it? Is it Tag, our boy, who loves to work outside? 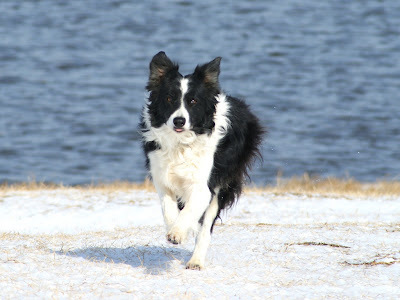 Is it Molly-Collie, the girl who owns my heart and soul? Or, is it Maggie May (a.k.a. the puppy), who will be two years old in nine days and chews us out of house and home? the first edition of Guess That Doggie? Well, I haven't really been wordless (am I ever? ), but click here to check out Wordless Wednesday! Great shot, BTW...she (he, maybe?) looks like she's havin' a blast, runnin' on the beach! I would say Maggie May, without knowing, this picture is adorable, it looks as if she would jump out of my screen ! I tagged you here Dork! Eh, everyone else guessed the one I guessed, so I won't win. Great pic, though!